I am a supertaster. Because of this, I don't like coffee. But I do love to host dinner parties. 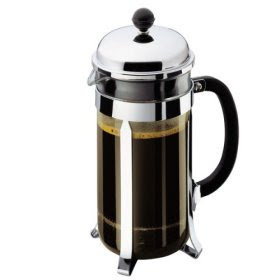 I have added this Bodum Chambord coffee press to my Amazon wish list because next time I have people over for dinner, I want to be able to offer them fancy coffee that they will watch me make in my pretentious coffee press. I will not drink the coffee, but others will taste it and think that I am classy and refined. Stovepipe Hawk: That [insert name of fancy and complicated dish here] was delicious. Me: Why thank you. Would anyone like some coffee? NoName Dartmouth: Yes, thank you, I would love some. Me: I'll just whip some up right now in my Bodum Chambord coffee press. Mona Hanford: (tasting coffee) This is the best coffee I have ever had. Margareth 4: You are classy and refined. I like audiobooks. They're great when I can't devote my full attention to reading (when I'm walking down the street) or when I can't be bothered to hold a book (when I'm working out) or when I don't want others to see what I'm reading and silently judge me (when I'm reading In Her Shoes). The problem is that even my super-fancy iPod can't handle my audiobook workflow. You see, I like to go to the library, borrow an audiobook, and download it onto my portable music-playing device in mp3 format. Then I like to speed up the tempo so I can listen to my book at normal reading speed. 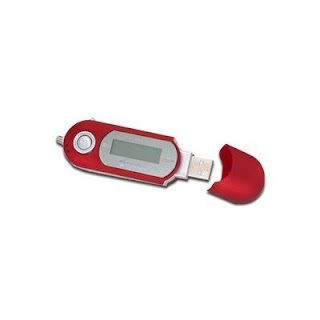 This Centon mp3 player is awesome. I'm recommending the 2 gig version. (I have the 256 mb version, which doesn't quite hold a whole book. You'd think that would be a dealbreaker for me. You'd be underestimating how cheap I am.) The 2 gig Centon can probably hold a couple of books, and it runs on 1 AAA battery. It plugs right into a USB port and has drag-and-drop functionality, an FM tuner, and a voice recorder. I'm not sure whether other cheapo mp3 players have the functionality I need, but none say they do on the box. I'm telling you, go with the Centon. Q: Are you worried that you're missing the experience of an audiobook by speeding it up? A: Do you mean am I worried that I'll miss out on the subtle nuances voiced by the C-list actress reading a Jennifer Weiner novel aloud to me? No. Q: Are you sure my iPod can't do this? A: As far as I know, iPods can only speed up audio of certain formats of audiobook recordings. Good old ripped mp3s are doomed to be normal speed. Action item for Steve Jobs: make your product do what I want it to do. Q: Amazon reviewers say this mp3 player is crappy. A: First, that's not a question. Second, sometimes Amazon reviewers are crappy. My Centon has worked for over 3 years and is still going strong. Q: Is this worth the money? A: It's $20. Get over yourself. Bonus points because you can speed up music for the gym. Have you ever heard The Postal Service sped up to 80s-punk pace? Amazing. I like to appear witty and well-read at parties. I could read a bunch of books, but I don't know that I care that much about any one topic. Instead, I subscribe to Smithsonian Magazine. It allows me to indulge in two of my favorite things: reading about wacky things and appearing smarter than I actually am. Smithsonia covers everything from history (a 19th century steamboat perfectly preserved in mud!) to nature (cheetas! mountain gorillas! bonobos!) to scientific discoveries (I kinda skim these articles). Plus you get to feel smug for supporting the Smithsonian. Now I will share a few examples of times when reading Smithsonian Magazine comes in handy. I was at a party talking to a woman who is getting her PhD in something I can barely follow (something about biology and nutrition). I casually steered the conversation to bonobos. Aren't they awesome? 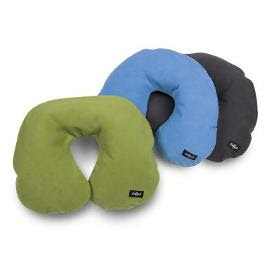 This neck pillow from Eagle Creek (the full-size version--I can't vouch for the compact size) is by far the best thing ever to happen to my neck on an airplane. It blows up with two quick puffs of air, has a removable fleece cover, and fits my huge neck with ease. I have the gray one and it reminds me of getting a big hug around the neck from a koala. I've never actually been hugged by a koala, but I assume this is what it would feel like. Bonus points because I bought it from Sky Mall. You're not a real traveler unless you get Sky Mall delivered to your house.